I’ve been making this dish since I was a teenager. I can’t even remember the source anymore, and over the years, it’s changed from the original recipe to something entirely anew. But it remains one of my favorite things to cook and eat. 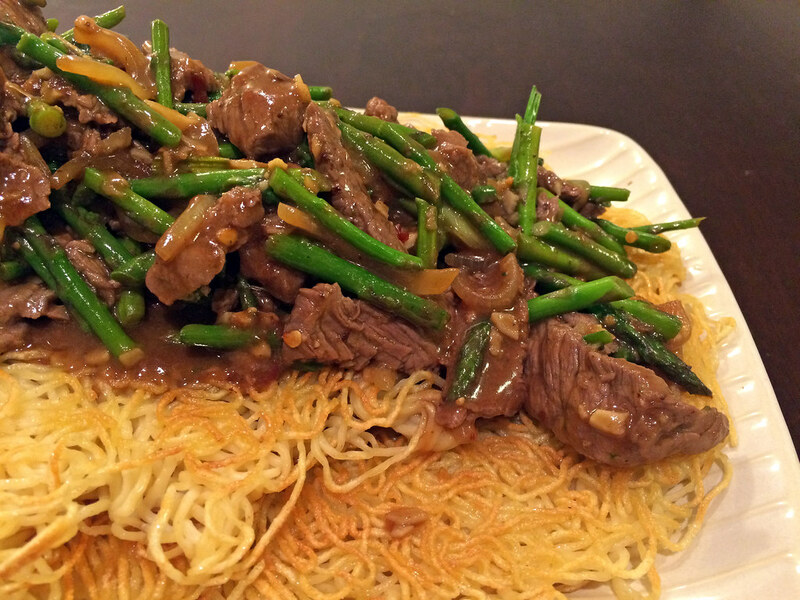 The Hong Kong-style crispy noodles soak up the spicy, savory sauce oh so wonderfully. The meat is tender. The vegetables are crisp. This dish, my friends, hits all the right notes. It may take a while to cook, but the results are well worth it. The leftovers won’t last nearly as long as you think they will. Consider yourself warned. 1. Marinade beef: stir rice wine, soy, 1 1/2 teaspoons cornstarch, garlic and ginger in a large bowl. Add beef to marinade. 2. In a separate bowl, mix chicken broth, oyster sauce, chili garlic sauce, remaining 1 1/2 teaspoons cornstarch, pepper and sesame oil together. Set aside. 3. Cook noodles in large pot, according to directions. Drain, rinse under cold water, drain again. 4. Heat nonstick skillet over medium-high heat. Add 1 tablespoon of oil and coat. Spread noodles evenly and cook, pressing lightly from time to time to form a cake, until bottom is golden brown, about 5 minutes. Turn cake over. Drizzle one tablespoon oil on bottom and cook other side, about 5 minutes. Transfer to plate. 5. Heat wok over high heat and add remaining tablespoon of oil. Add meat and stir fry until cooked through and no longer pink. Remove from wok. Add onion to wok and stir fry for two minutes. Add asparagus and cook for four minutes. 6. Return meat to wok, pour in sauce and bring to boil. Cook until slightly thickened, about two minutes. Spoon over noodle pancake and serve. This fiery curry is colossal. Left overnight to meld flavors and reheated the next day, it’s perfection alongside a plate of basmati rice and cooling yogurt. Make sure to allow the meat enough time to marinate and adjust the amount of cayenne pepper depending on your heat tolerance. If spicy curries are your thing, go to town. My spice tolerance used to be pathetically low, but with practice, I’ve gained a respectable ability craving for heat. If I can do it, so can you. 1. Lightly toast curry powder and fenugreek seeds in a small pan. Mix with beef, cayenne pepper, paprika, and vinegar and marinate overnight. 2. Heat oil in pan. Saute onions, garlic, ginger, green chiles, curry leaves, lemongrass, cinnamon, cardamom, and cloves until onions are translucent. 3. Add marinated beef and fry for several minutes, turning occasionally, until beef is browned. 4. Add 1/4 cup water to the marinating bowl to release the remaining spice mixture and add to pan. Add remaining water and bring to a boil. Reduce heat, cover, and simmer for 30 minutes. 5. Add coconut milk, salt, and tomato paste and simmer, partially covered, for an additional 40 minutes, until curry is thick. 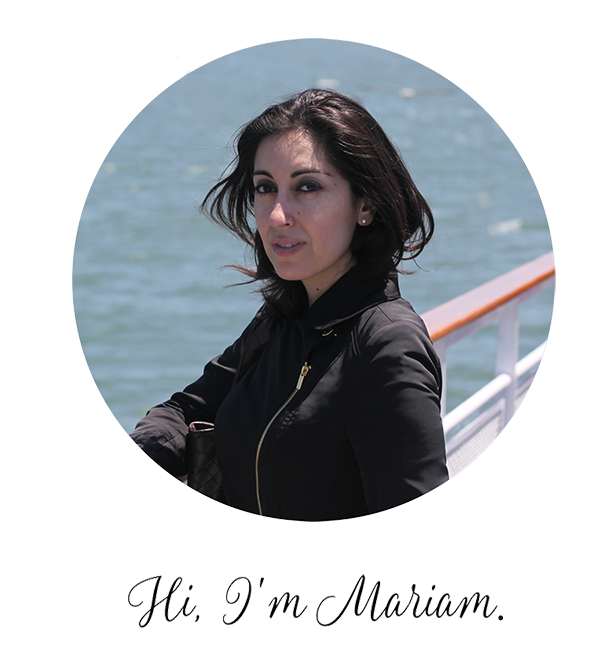 I’m going to tell you a story about Mongolian beef: ever since I was ten years old, my family has been going to a Chinese restaurant in Sonoma County that makes the greatest Mongolian beef I’ve ever tasted. Scratch that, it’s one of the best dishes I’ve ever tasted. For over twenty years, it’s ranked among my top three favorite dishes of all time. 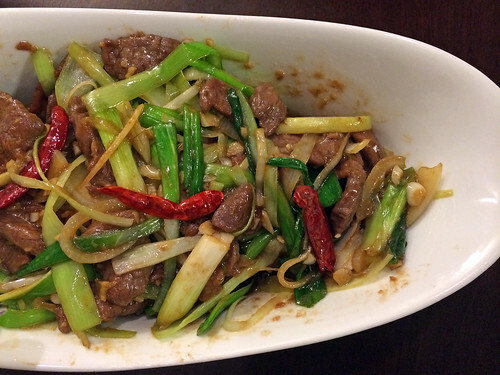 Naturally, I’ve tried to guess the recipe for this Mongolian beef in an effort to replicate the results at home. I’ve tried. And I’ve tried. And then I’ve tried at home. I’ve probably attempted fifteen different versions. I just can’t get it right. This version, adapted from an old Martin Yan recipe, is almost right. 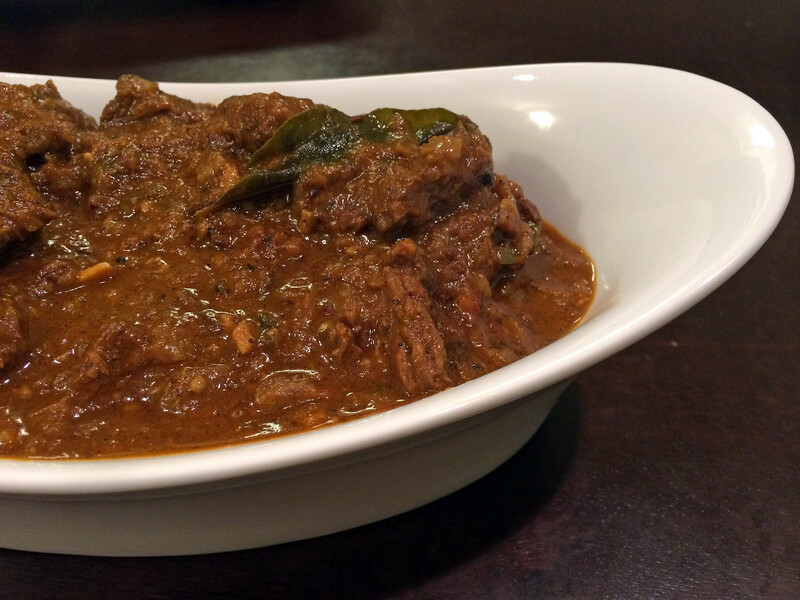 The original recipe employs lamb but beef works just as well. Curiously enough, this version includes leeks. Don’t omit them, as they’re key in building up a sweet onion flavor. More than twenty years later, I still haven’t gotten that nostalgic dish 100% right, but until I do, this is the next best thing. 1. To make the marinade, combine 2 tablespoons soy sauce, rice wine, and cornstarch in a bowl and mix well. Add the beef and stir to coat evenly. Let marinade for at least 20 minutes. 2. To make the sauce, combine the hoisin sauce, rice vinegar, and remaining 2 tablespoons soy sauce in a bowl and mix well. 3. Place a wok over high heat until hot. Add 1 tablespoon of the oil, swirling to coat the sides. Add the beef and stir-fry until no longer pink, about 3 minutes. Remove the meat to a plate and set aside. 4. Return the wok to high heat and add the remaining 1 tablespoon of oil. Add the garlic and chiles and cook, stirring, until fragrant, about 10 seconds. Add the leeks and onion and stir-fry until the leeks are wilted, about 1 minute. Return the meat to a pan. Add the sauce and toss to coat. Transfer to a serving plate and serve warm. Japchae was the first Korean dish I tasted when I first tried the cuisine years ago as a teenager. It became one of my favorites but I rarely order it at a restaurant anymore because I’ve learned to cook it at home. This recipe is laborous but the results were restaurant quality and totally worth the payoff. Don’t substitute these sweet potato noodles — they’re worth seeking out for their chewy, slippery texture that soaks up all the flavor. 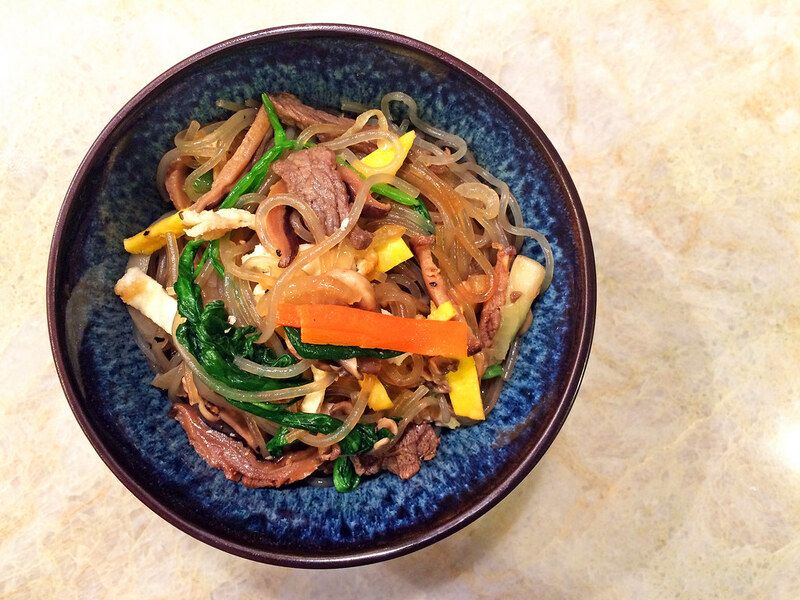 Best of all, japchae reheats well and tastes just as good the next day. 1. Put the beef and shiitake mushrooms into a bowl and mix with 1 clove of minced garlic, 1 teaspoon sugar, ¼ teaspoon ground black pepper, 2 teaspoons soy sauce, and 1 teaspoon of sesame oil with a wooden spoon or by hand. Cover and marinade in the fridge. 2. Crack the egg, add a pinch of salt, and whisk with a fork. Add 1 teaspoon of vegetable oil to a heated nonstick pan. Pour the egg into the pan and tilt around so the mixture spreads thinly. Let the egg cook on low heat for about 1 minute. Flip it over and let it sit on the pan for 1 more minute. Remove from heat, let the egg cool, and slice into thin strips. 3. Bring a pot of water to a boil. Add the spinach and blanch for 30 seconds, then drain and rinse under cold water to keep from cooking further. Squeeze to remove any excess water. Coarsely chop spinach and place in a large mixing bowl. Mix with 1 teaspoon soy sauce and 1 teaspoon sesame oil. 4. Bring a large pot of water to a boil and put the noodles into the boiling water and cook for 1 minute. Stir noodles with a wooden spoon to keep them from sticking together. Partially cover the pot and keep cooking for another 7 minutes until the noodles are soft and chewy. Strain and cut noodles in half with kitchen scissors. 5. Put the noodles in the large bowl with the spinach. Add 2 teaspoons sesame oil, 1 teaspoon soy sauce, and 1/2 teaspoon sugar. Mix well. 6. Heat a skillet over medium high heat. Add 2 teaspoons vegetable oil and add the onion, green onion, and a pinch of salt. Stir-fry about 2 minutes until the onion is translucent. Transfer to the bowl with noodles. 7. Heat the skillet again and add 2 teaspoons vegetable oil. Add the white mushrooms and a pinch of salt. Stir-fry for 2 minutes until softened and the mushrooms have released a little juice. Transfer to the bowl with noodles. 8. Heat the skillet and add 1 teaspoon vegetable oil. Add the carrot and stir-fry for 20 seconds. Transfer to the bowl with noodles. 9. Heat the skillet and add 2 teaspoons vegetable oil. Add the beef and shiitake mushroom mixture and stir fry for a few minutes until the beef is cooked through and the mushrooms are soft. Transfer to the bowl with noodles. 10. Add 1 minced garlic clove, 1 tablespoon soy sauce, 1 tablespoon sugar, 1/2 teaspoon black pepper, egg garnish, 1 tablespoon sesame seeds, and 2 teaspoons of sesame oil to the mixing bowl full of ingredients. Mix all together by hand, transfer to a large plate and serve. It’s been just over a month since I came back from a vacation in Spain, and I thought I was all jamon’d out. I thought wrong. There’s not much to this sandwich but the cornucopia of Spanish flavors here would have you thinking otherwise. Creamy manchego cheese, salty jamon, and a touch of sweet membrillo paste transform a few simple ingredients into something spectacular. 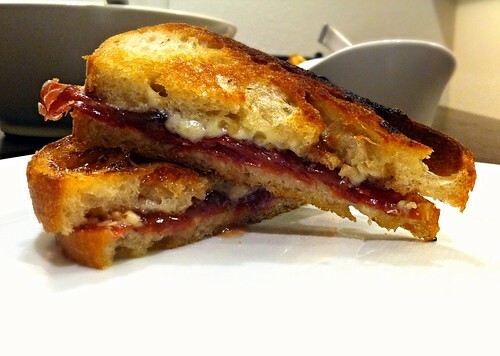 Try this and see: your grilled cheese game just got one-upped. 1. Spread half of the cheese evenly over two slices of the bread. Top with the serrano, membrillo, and the remaining cheese. Top with the other two bread slices. 2. Heat one tablespoon of the butter in a skillet over medium-low heat. When hot, add the sandwiches and cook slowly until deep golden on one side, about 5 minutes. Add the remaining 1/2 tablespoon butter and flip the sandwiches over. Continue to cook until the other side is also golden and the cheese is melted, about 4 minutes longer. 3. Let the sandwiches rest for a minute before slicing and serve immediately.